With the release of our Techie 4.0 Mystery Box, we wanted to give you a few tips when it comes to teching on your Airsoft guns. We here at Airsoft GI have been offering repairs for several years. We’ve also been an industry leader in quality of work for many years. Today, we’re going to give you a few tips when opening up your gearbox. As with anything, you want to take your time when working on your guns. If you’re first starting out, you want to walk before you can run. 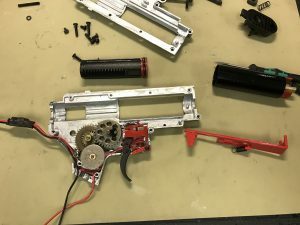 If you’re working on your own gun, take your time and do it right. There’s no point going quickly, only to fail because there’s no Anti-Reversal latch. 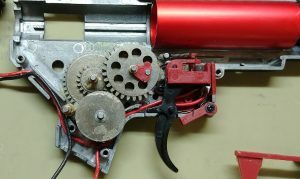 An Airsoft Gearbox is a fairly complex piece of machinery. Don’t put yourself down because you don’t get it the first time. Being able to complete any job requires knowledge and sometimes tools. Having the correct tools for the job will always help you. Depending on the brand, you might need, Allen Keys, some Screwdrivers, a couple of punches. Using the wrong tools might damage the components in your gearbox, leading to other issues. Shimming your gearbox may be seen as an advanced technique but, it’s a basic skill that should be known. Learning how to shim will yield better results than putting in premium parts. Parts don’t mean anything if your drive train doesn’t mesh properly. Proper shimming also leads to a more efficient gearbox. Giving you a longer battery life and elongates the life of your parts. Teching is a skill that is quick to learn but can take a lifetime to master. Take your time when doing your work and you’ll be ok. If you’re ever in doubt we are always happy to assist with our World Class Tech Department. There isn’t a single project that we can’t handle!